DESPITE a tighter job market, employment numbers for fresh university graduates took a slight dip last year, according to a survey by three local universities. Nearly nine in 10 found jobs within six months of graduating last year, but the 89.3 per cent figure for 2013 was less than the 91 per cent in 2012. Salaries also remained flat overall. Those who secured full-time jobs last year earned a median monthly salary of $3,050, the same as the year before. The average monthly wage was $3,229, compared with $3,260 in 2012. These were the findings of the second joint graduate employment survey conducted by Singapore's two biggest universities - National University of Singapore (NUS) and Nanyang Technological University (NTU) - plus Singapore Management University (SMU). A total of 10,534 full-time fresh graduates took part. Human resource experts expected employment figures to be better, as the job market is strong. "The business outlook has improved and there was active employment even in the last quarter, so I would have thought the figures would be higher, not just consistent," said Mr Paul Heng, managing director of NeXT Career Consulting Group Asia. Still, managing director of PeopleWorldwide Consulting David Leong believes the slight dip was "not a cause for concern" as demand for graduates is high. "The Government has also improved employability of local graduates... by tightening the inflow of foreign workers," he said. The figures for the individual universities involved painted a better picture for SMU, with 92.3 per cent of its graduates getting jobs within six months of graduating, up from 91.7 per cent. Those in full-time jobs earned an average monthly pay of $3,455 - the highest since its pioneer cohort graduated in 2004. The overall employment rate at NUS, the country's oldest university, fell slightly from 90.1 per cent in 2012 to 89 per cent last year, with average monthly salaries of those in full-time jobs at $3,206. 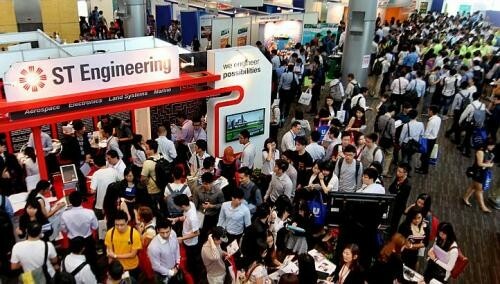 NTU's employment rate dipped from 92 per cent in 2012 to about 90 per cent last year. The average pay of its graduates per month was $3,187, compared with $3,239 in 2012. Aerospace engineering graduates were NTU's biggest earners, like the year before. They had a median pay of $3,500 a month. Those from business and computing, and accountancy and business had median monthly salaries of $3,400 and $3,350 respectively. The three universities also had a separate survey of 579 graduates from architecture, biomedical science (traditional Chinese medicine), law, medicine and pharmacy courses, who had to spend a year or more on practical training such as pupillage or housemanship, before starting work proper. The overall employment rate of this group, most of whom completed their studies two years ago, was 98.3 per cent, compared with 98.6 per cent in 2012. The median gross monthly pay for those who received full-time positions was $4,500. Topping the pay charts were newly minted lawyers from NUS and SMU, who earned average monthly salaries of $5,099 to $5,617.